The wooden door was burned, and smoke damaged interior plaster and works of art inside the church. No one was injured. The church had been at the center of the controversy a few days before the attack because the 'Sentinelle in piedi' group had set up a nativity scene with dozens of plastic fake human fetuses scattered on the path of the Three Kings, with the words "The Massacre of the Innocents continues..."
"Expressing one's thoughts by damaging the symbols and property of others, with violence and arrogance, is always wrong. In a democracy there are other ways to express one's ideas. 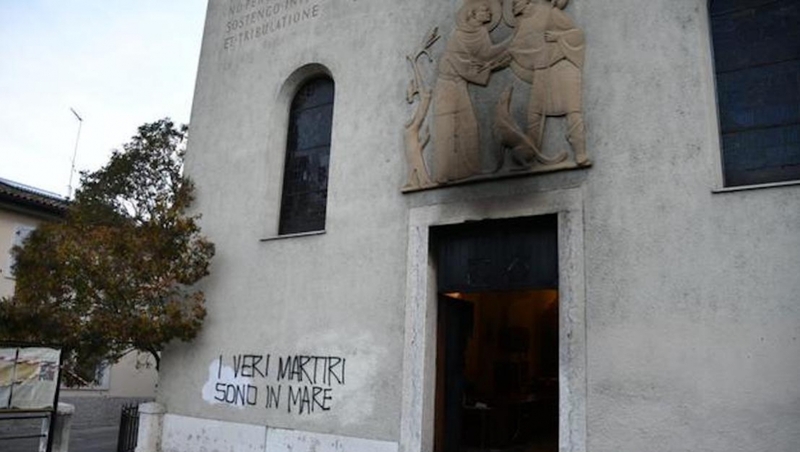 Whoever set fire to the entrance of the church of San Rocco in Rovereto, is an enemy of dialogue and peaceful confrontation."